The new machine will increase our capacity but more importantly it will reduce our lead-time to market to meet or exceed our customers’ delivery expectations. APG Cash Drawer, a fast-growing global manufacturer of cash management solutions, announced today the investment of $1 million in automation at its European headquarters & manufacturing plant in Newhaven. 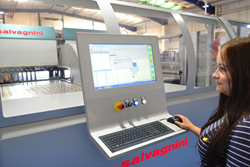 The new manufacturing technology signifies APG’s commitment to quickly deliver the latest cash drawer & cash management technology to retailers in Europe and beyond. About APG Cash Drawer, LLC – APG Cash Drawer, with over 39 years of experience, manufactures a wide range of highly durable and reliable cash drawers that are delivered quickly to the marketplace. APG has built a reputation as the supplier of choice for cash management solutions for retail, grocery, hospitality, and quick serve for thousands of customers throughout the world. Whether it’s our general application cash drawer, custom designed solutions, or the SMARTtillTM Intelligent Cash Drawer, our products and brand are differentiated by our ability to deliver innovative technologies that globally enhance efficiency and security at the point of sale. To learn more about our products, visit http://www.cashdrawer.com/europe or call +44 1273 616300. Follow us on Twitter at @apgcashdrawer and on Facebook.